If ever I need a respite from the hubbub of Folkestone town centre, there is no better area to take cover in than The Bayle. Bordering the Harbour via the Parade Steps, the Creative Quarter by Bayle Street and Sandgate Road at the end of pretty Church Street, it provides a welcome haven of peace and quiet. Just off the beaten track, it is largely undiscovered by all but locals. Today, I am accessing it from the recently refurbished Parade Steps that run from Harbour Street, alongside Gillespies bar at the True Briton. Folkestone has more than its share of crippling paths and stairways, not least the Metropole Steps and Zigzag Path that link the main beach from The Leas, but the hundred or more steps that need to be negotiated here match the most difficult. Their saving grace is that they do afford the intrepid climber fantastic views of the harbour and the Channel beyond when, as is essential, they pause for a breather at each level. At the top you encounter not only Shangri-La, now discredited as a wartime German spy centre, but also fine multi-occupancy buildings like Blue Diamond House on Bayle Street. Eschewing the Bail Steps, that lead back down to the Old High Street, I turn left at the friendly Guildhall pub onto The Bayle itself. Within a hundred yards I come across the Bayle Pond Gardens, lovingly maintained by the residents’ association. The pond is home to another of the Folkestone Artworks found scattered around the town. One of Tracey Emin’s collection of “baby things”, a bedraggled, brightly coloured mitten, is attached to the railings that encase the pond. 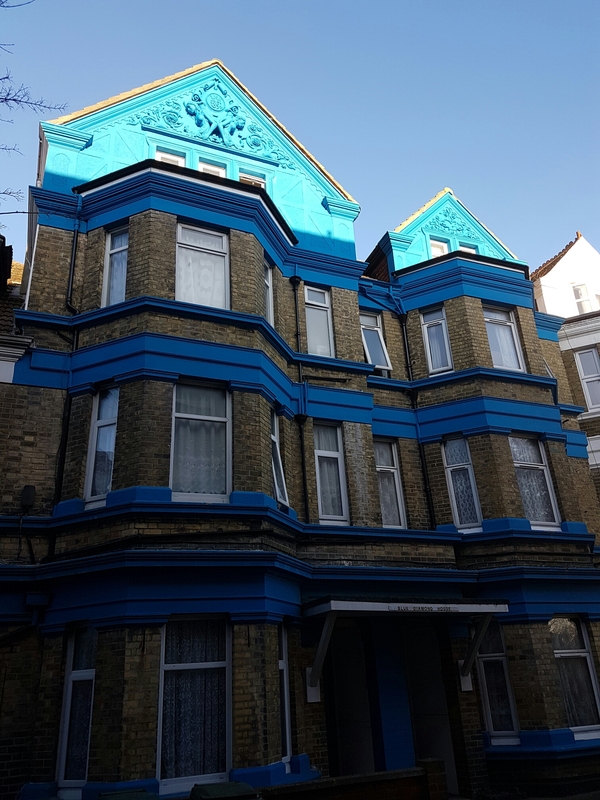 Properties, a mix of attractive brick and weatherboarded cottages and modern apartment blocks, are sought after and, as this recent house hunter can attest, relatively expensive. Moreover, the significance of this part of town was recognised when number 5 Bayle Street was chosen to launch the fabulous Folkestone Living Advent Calendar programme on 1st December last and, fifteen days later, the Dance Easy / Folkestone Yoga studio at number 19 took its turn in the festivities. 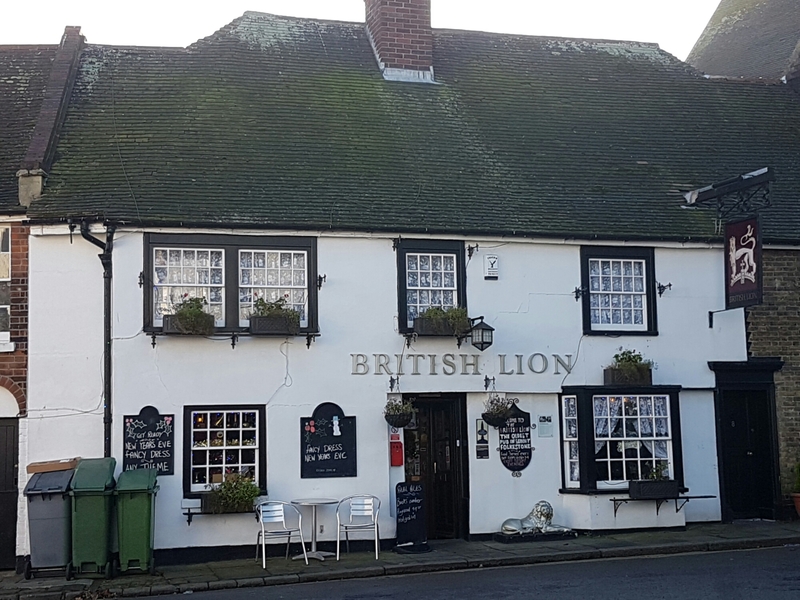 In addition to the already mentioned Guildhall pub, this compact area also boasts Folkestone’s oldest watering hole, the British Lion, reputedly built no later than 1500, and Charles Dickens’s local when he stayed at nearby 3, Albion Villas. Recovered remains from archaeological digs have revealed that the area was occupied in the late Iron Age and Roman periods, but it was not until the seventh century AD that Folkestone gained its most celebrated citizen. The daughter of King Eadbald, St. Eanswythe, an intelligent, wilful and devout young woman, rejected numerous Anglo-Saxon suitors and opted for the religious life by establishing a small nunnery and dedicating herself and other women to prayer and service of the poor. On her death in 640, her tomb became the object of prayer and pilgrimage and her relics were sought after and venerated. She was made a saint almost immediately. Standing between bare winter trees and amidst battered headstones, the current Church of St Mary and St Eanswythe, built upon a twelfth century original, is a lovely, tranquil space. There are several routes in and out of the churchyard. My personal favourite is to walk through the internal gate, along the path (which starts on Priory Gardens) back to the War Memorial, taking in glorious views of the Channel above the rooftops of Marine Parade.